is an IBM Business Partner Company. RVI is an Enterprise Content Management (ECM) solution that enables you to digitize and organize your documents making them available for later retrieval including secured access over the web or even from a mobile device. Digital documents are easier to find, share, protect and manage resulting in greater efficiency and faster responses. Backup capabilities for electronic documents are significantly improved versus storing physical paper records. For the past 25 years, Real Vision Software has developed and supported the RVI ECM systems. Our initial version was specific to the AS/400 platform and marketed as an IBM logo software product for ten consecutive years. Our customers depend on RVI every day to operate their business efficiently. Government agencies, medical providers, transportation firms, manufacturers, distributors and finance / insurance institutions are just some of the many industries using RVI Enterprise Content Management to battle their paperwork challenges. 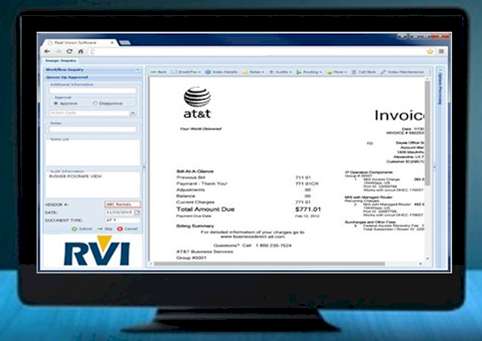 RVI software was designed to easily integrate with existing software applications. The RVI product includes powerful features to accommodate various needs throughout the organization. The simple price structure of RVI allows for growth. The IBM logo is a registered trademark and the IBM Business Partner Emblem is a trademark of International Business Machines Corporation of America and are used together under license. √ Virtual-Print-Driver for importing other file types. Real Vision Software, Inc. (RVI) developes RVI Basic, RVI Spool File and RVI Complete Enterprise Content Management solutions for the IBM AS/400. RVI Mobile ECM and Mobile Signature Capture becomes available. RVI Cloud 9 and RVI for Windows applications are now available! One Look viewer for 3 Platforms now available!